With the NFL draft just over a week away, it's time to start the arguments over the Vikings' biggest needs and how they should handle them. The majority view has been that the Vikings need to address their offensive line issues right away. However, there's no consensus on who they should take in the first round with their pick, currently No. 18. The latest Yahoo Sports draft has the Vikings taking Jonah Williams of Alabama, who could move into the lineup at guard or tackle. Eric Edholm writes: "A few weeks ago, it felt unlikely Williams could fall this far. Now it’s a legit possibility. Williams could start Day 1 at guard or tackle and give Mike Zimmer exactly the kind of smart, versatile, battle-tested offensive lineman to spur the run game. Williams is a perfect fit here." The CBS Sports draft chooses offensive tackle Greg Little of Mississippi. Tom Fornelli writes: "If I'm the Vikings I'm probably using multiple picks on the offensive line in this draft. They start in the first round with Greg Little, who may not prove to be a cornerstone, but should be a regular starter at the NFL level." NFL.com's Daniel Jeremiah has the Vikings taking center Garrett Bradbury of North Carolina State: "Bradbury was made to play in this Gary Kubiak-style offense. The Vikings will move Pat Elflein to guard to clear a spot for the rookie at center." Draftwire's Luke Easterling uses the Vikings pick to take tackle Jawaan Taylor of Florida: "Unless one of this year’s elite defensive prospects falls all the way to this pick, the Vikings need to be targeting the best available offensive lineman here. In this scenario, that comes in the form of Taylor, an athletic and physical blocker with successful experience at both left and right tackle. Don’t be surprised if the Vikings still use another early pick to also address the interior of their offensive line, as well." The Ringer;'s mock draft guide has the Vikings going for defense and taking Clemson interior lineman Christian Wilkins. Danny Kelly writes: "Wilkins should be a relatively safe pick as a high-floor, instant-impact contributor. He can play on all three downs at multiple spots on the line, and as a fiery on-field leader, he should boost the intensity of the players around him from day one." The Sporting News picks Oklahoma guard Cody Ford for the Vikings, with Vinnie Iyer writing: "The Vikings desperately need to improve their interior blocking around center Pat Elflein. Ford is a raw lineman better suited for guard who can first be a big asset in run blocking before rounding into a physical pass protector. Dalvin Cook and Kirk Cousins should approve." If you want to do a deeper dive into almost 100 mock drafts, there's a data base compiled by SB Nation's Adam Stites, which includes national and local draft sites. The range of choices for the Vikings mentioned above is reinforced by the variety of opinions in the survey. It's a deep,deep rabbit hole. Enter here at your own peril. College basketball is done for the season, with a worthy and exciting finish to an NCAA men's basketball tournament that took an assortment of twists and turns, right down to having two teams that were first-timers in the title game for the first time since Magic vs. Bird 40 years ago when Michigan State defeated Indiana State. Here are four very different things that we thought about as the final buzzer sounded and Virginia came out with the title after beating Texas Tech in overtime. 1. How did Virginia ever lose to Maryland-Baltimore County in the "16 seed beats 1 seed shocker" of 2018. Let's go to the highlights and see. 2. Should you have gone to the game Monday night? The title game ticket wasn't a hard one to find, with fans of the losing teams and many coaches (among others) leaving after Saturday's semifinals. 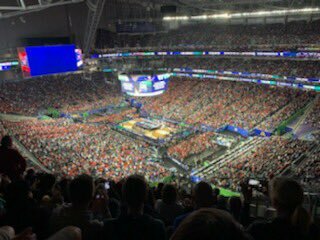 Well, if you did go to the game, there's a pretty good chance you ended up with a view something like this, which was from midway up in Section 334 at U.S. Bank Stadium. So you were probably better off in the basement or the bar. (There were 10 more rows of seats behind this one.) The person who received this photo, who recovered quickly from being jealous, thought it might be helpful to offer score updates to the sender. 4. What was the scene in Lubbock after Texas Tech lost? After the reports of sofas burning and other mayhem when the Red Raiders defeated Michigan State on Saturday, things were a bit more subdued, as these Associated Press photos show.